There are many other solubility theories: MOSCED, UNIFAC, Jouyban-Acree, Yalkowsy, MOD (Mobile Order and Disorder). They all have attractive features. We also have the highest respect for Professor Hildebrand’s pioneering work on solubility parameters. Without Hildebrand’s work, HSP would not exist. But now we have 10 good reasons to use HSP instead of other solubility theories..
1 HSP completely include Hildebrand solubility parameter. 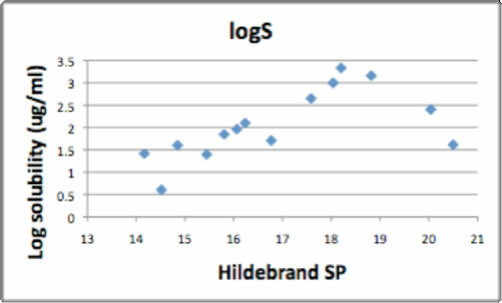 Hildebrand SP can be calculated from Hansen SP by the relationship. 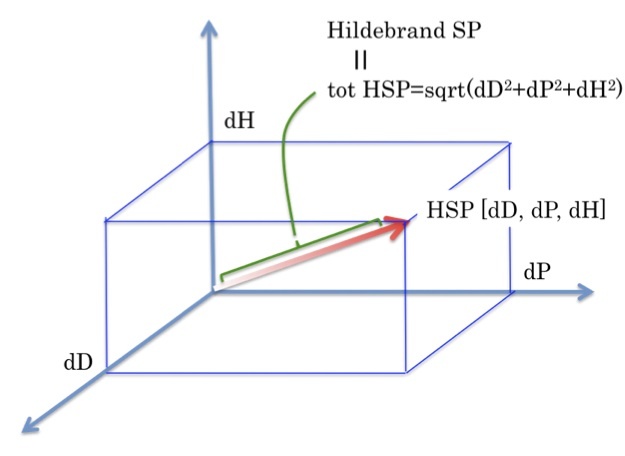 So if you insist on using Hildebrand SP, you can just use tot HSP. When HSP are plotted on a 3D graph as vectors [X, Y, Z]=[dD, dP, dH], Hildebrand SP is the length of the Vector. So HSP completely include Hildebrand SP. And what Hildebrand SP says is that the sphere surface of the same length vectors, will have the same solubility properties. 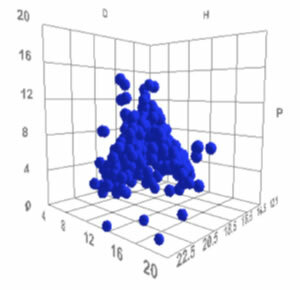 We choose 391 compounds whose Hildebrand SP equals 19 plus minus 0.3, and plot these compounds in 3D graph. Some are large dD and small dP, dH.Some are large dD and dH. But the distance from [0,0,0] are almost same 19.0. From HSP point of view, these compounds do not have the same solubility. 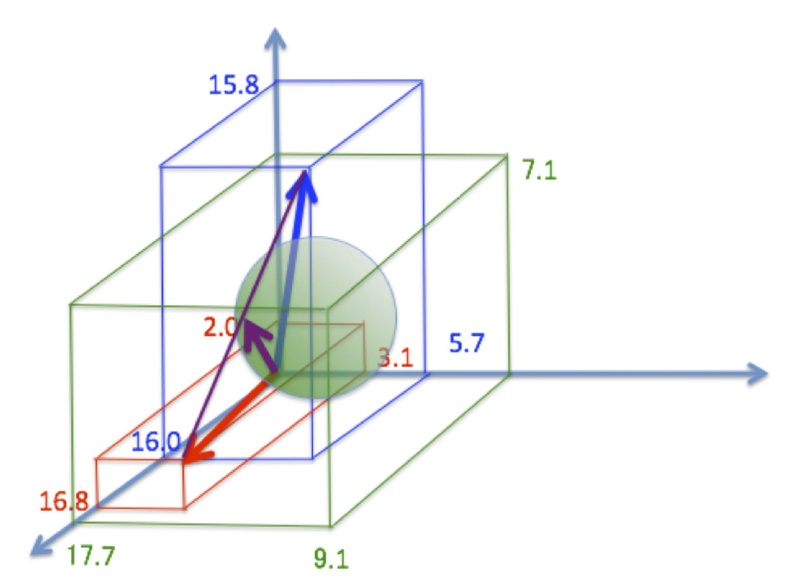 When we use “like dissolves like”, our likeness means “near the vector”, not the distance from [0. 0. 0]. 2 HSP has the concept of Interaction Radius. information. For example, using solvents and non-solvents of Polyvinylchloride we give solvents a score 1 and non-solvent have a score 0 in the table. Drag=Rotate, Drag+Shift=Larger/Smaller, Drag+Alt or Command(Window key)=Translate. Single Sphere for PVCl. Drag=Rotate, Drag+Shift=Larger/Smaller, Drag+Alt or Command(Window key)=Translate. Double Sphere for PVCl. If you are using HTML5 enable browser such as Chrome or Safari,FireFox (IE9 is out of support), you can see the Sphere. If you pick solvent, solvent name will appear. Good solvents are red, bad solvents are Blue. The centre of the sphere is the perfect solvent for PVC. The radius of the sphere gives the limit of good solvents. By calculating each HSP distance (Ra) (See sec. 3) a Relative Energy Difference (RED) is determinded RED=Ra/R0 i.e. whether the solvent is inside or outside the sphere. Ra>8 solvents will not dissolve poly vinyl chloride. So DMF, DMSO and Dioxane are exceptions. And Ra<8 solvents will dissolve polymer. So Carbon disulfide and vinyl chloride are exceptions. 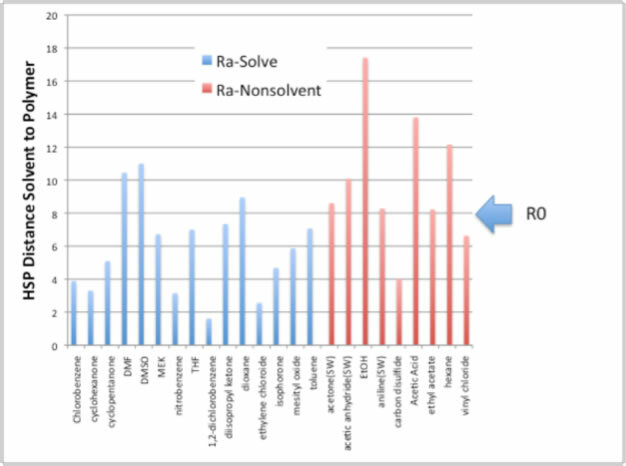 There are some reasons even Ra<R0 can give a non-solvent. Sometime the solvent volume is too large and will not penetrate into the polymer. Or HSP is not kinetics so it will not tell how much time is needed to dissolve the polymer. There are few exceptions, but from a practical point of view, this result helps researchers to much to find good solvents. When we examine polymer solubility with Hildebrand SP the results are confused. We can never find out which solvent will dissolve PVC! Unfortunately, other solubility theories don’t give the spheres, Ra’s, REDs so have no way to provide the sort of practical information for the real-world scientist. mixture of solvents just like “Addition of Vectors”. There are a lot of examples where two non-solvents create a good solvent when mixed. For example, PMMA[17.7, 9.1, 7.1] (Green) is insoluble in butanol[16.0, 5.7,15.8] (Blue) and insoluble in diethyl sulfide[16.8, 3.1, 2.0] (Red). You can easily find out that the Blue vector and Red vector are very far from the Green sphere center. But with a 50:50 mixture of butanol and diethyl sulfide, the new vector [16.4, 4.4, 8.8] (Purple) is very near to center of Green sphere and this blend dissolves PMMA! If you are using HTML5 enable browser such as Chrome or Safari,FireFox4 (IE9 have problems), you will see this Sphere. If you pick solvent, solvent name will appear. This was an early proof of the HSP concept and a very good reason to use HSP But now we have additional good reason to use HSP for binary system. 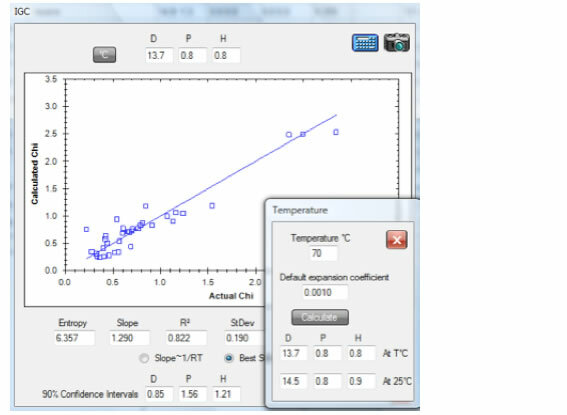 Because now we can handle Activity coefficients, Henry constants, Margules parameter and azeotrope system, in new version of HSPiP. 4 HSP can handle insoluble solubility. chemicals which do not vaporize there is not a direct way to determine solubility parameter. For example, Ionic liquids have no vapor pressure, and the solubility parameter cannot be determined directly. But we can determine HSP with the technique explained in section 2. We can also use HSP for nano Carbon, pigments, glass. There are some objections that Hildebrand SP can also be used to determine insoluble (or non-vapourisable) solubility. For example, researchers measured solubility of C60 with several solvents. There seems to have good correlation of Hildebrand SP with solubility of C60. And the paper author made conclusion C60 Hildebrand SP is 18.4. But several years after, other researcher published other data. When we plot all the data, the Hildebrand plot becomes confused. The top peak shift to 20.3 (25000ug/ml), but near it is a Hildebrand SP=19.7 solvent which dissolves just 1ug/ml. 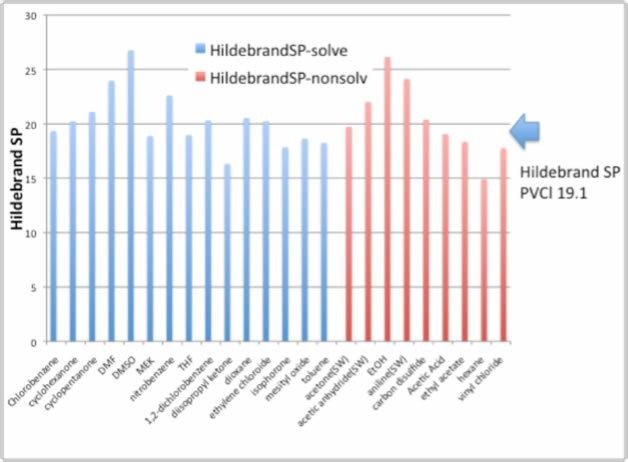 So for a treatment of a very narrow range of solvents, Hildebrand SP may give us good correlation. But a wide variety of solvents may confuse the results. (You already understand the reason if you read section 1). From Sphere experiments we find a good fit for C60 HSP is [20, 3, 2]. We can now plot HSP distance from C60 vs Log solubility for all the solvents. If you are using HTML5 enable browser such as Chrome or Safari,FireFox4 (IE9 is out of support), you will see this Sphere. If you pick solvent, solvent name will appear. The best fit to these data come if dD=22 instead of 20, but the general trend is correct. We can easily find out the relationship of “Short Distance of vector=high solubility”. But we need to explain one detail. Please notice there is 4 before dD term. This factor of 4 is hard to explain but is important for HSP. Please refer to our User’s Handbook or e-Book if you are interested to learn more. 5 HSP has an official Database. We have 1200+ official HSP chemical database and 600+ polymer database. Additionally we have a 6000+ database with calculated HSP data. we are compiling new compounds for use in the fragrance industry, compiling binary system data etc. And we check each data one by one to ensure reliability of our estimations. While compiling these data, we notice some errors in other databases or handbooks. Here is an example of contradictory data for Hildebrand SP. These DB-A, DB-B, DB-C are from very famous databases and a lot of researcher use them. But the Hildebrand SP values(unit (cal/mol)^0.5) are so different especially carboxylic compounds, or fluorinated compounds. Which value do you believe? 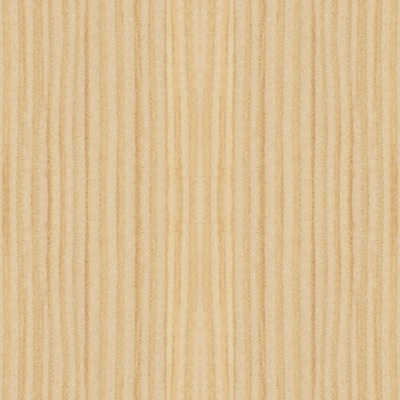 Hildebrand SP is convenient and widely used, but there is no official value. When you encounter problems, you need to search a lot of data source. 6 HSP has an official document and official software “HSPiP”. and “HSPiP e-Book”. And has official software. For Hildebrand SP, there are so many un-official documents and un-official softwares. But we have already pointed out in section 5, there are so many different values for the same compounds. So calculated values are strongly dependent on which data source they use to build the estimation scheme. You can not trace other researcher’s result without knowing which software uses which version. We are developing the official document and software day by day. Sometimes you might think “don’t buy now because there will soon be a much better version. But you have good reason to buy now, because our priority is our customers’ needs. We upgrade the software in response to customer requests and the whole HSP community benefits. Current users get free upgrades. New users pay more for newer versions. Can you substitute one solvent to the other just because solubility is equal? Solubility parameters say nothing beyond solubility. But in the real world, for example, boiling point is very important for design new solvents for ink or paint. No one will not want a paint which needs 1 month to dry, even if that solvent had the same solubility as White Spirit and had no problems with environment nor health. Our HSPiP is a total system for handling solvents in the real world. We continue to add a lot of functions which customer want to use. Most important information for solvent is flash point. 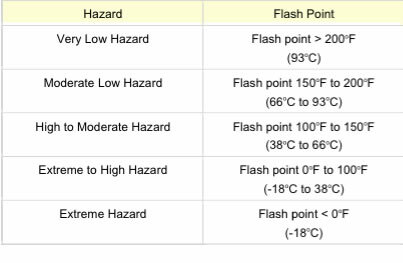 Hazard class are divided by range of Flash point. HSPiP predict not only solubility but also predicts Flash Point, reactivity with hydroxy radical and MIR, vapour pressure, partition coefficients etc. No other solubility theory implement these functions and so is less useful for the real world. 8. HSP is synergistic with other parts of science. important synergism effect is Analytical chemistry in particular Chromatography retention. From IGC HSP experimental values can be calculated. And with HSP values, we can predict Gas chromatograph retention index or HPLC retention time. We are also producing synergy with the Organic synthesis, medicine, Toxicology, Animal and scent or taste area. small teams in small areas for specialist applications. Only HSP is widely used across a large range of applications. Here is are the current contents of the e-Book. You can find out how widely HSP is used. And the e-Book contents are increasing for each edition. 1 The Minimum Possible Theory Why are HSP so powerful and why do 3 numbers turn out to be so fundamentally useful? You get the minimum theory for the maximum understanding. 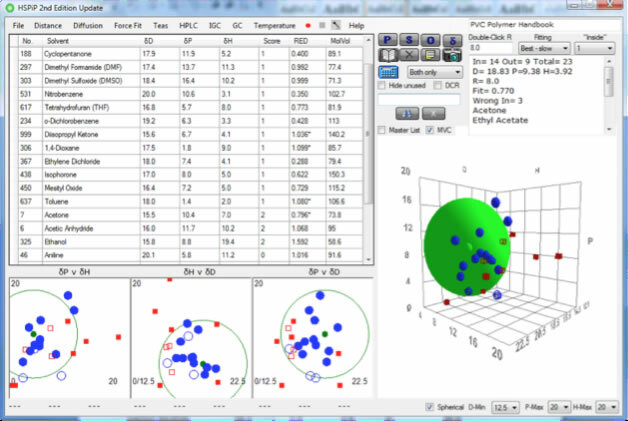 2 The Sphere How to understand HSP in 3 dimensions, using the powerful Sphere software that comes as part of the package. 3 Coming clean How HSP will help you quickly find a solvent to dissolve a specific polymer or ink. 4 Safer, Faster, Cheaper Using the Solvent Optimizer to find a safer, faster, cheaper solvent blend. 5 Coming together How HSP help to make incompatible polymers compatible. 6 Sticking together How HSP is at the heart of real-world adhesion. 7 Shades of Black How HSP can help with apparently intractable materials such as bitumen which require just the right interactions with polymers to make them suitable for road surfaces. 8 Insoluble solubility parameters Why “solubility” parameters are so useful for insoluble materials such as carbon black. 9 Cracks in the system How to recognize the potential for long-term “environmental stress cracking” problems with your polymers. 10 Let’s make this perfectly clear …Using HSP to design a high-gloss coating formulation. 11 That’s swell Understanding which solvents will swell rubbers or polymers – and how to optimize an e-beam resist. 12 Skin deep Using HSP to help understand skin and glove safety. 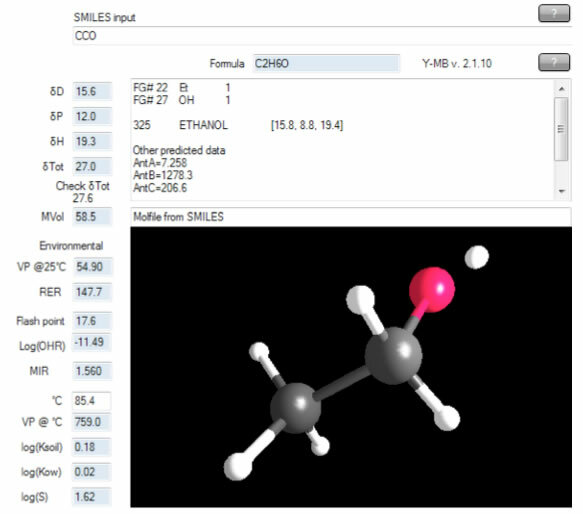 13 HSP and Diffusion A powerful but friendly diffusion modeller comes with the package so you can understand the complexities of absorption and desorption of solvents – and why HSP provide insights into the phenomena. 14 Saving the planet Using HSP for a big variety of Environmental issues. 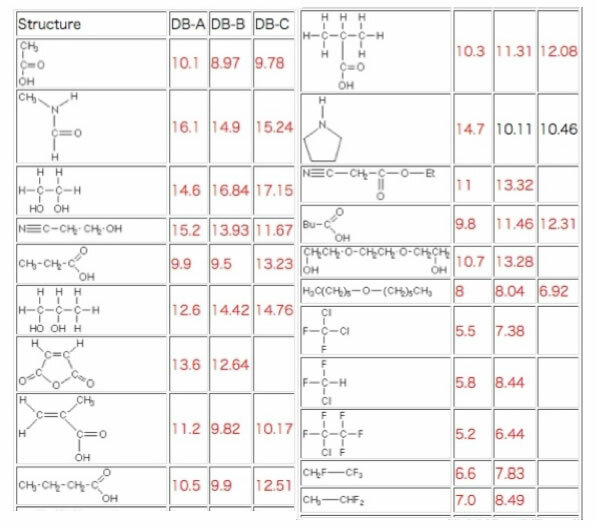 15 Cleaning by numbers HSP and surfactants, including the first published list of HSP values for a large range of surfactants. 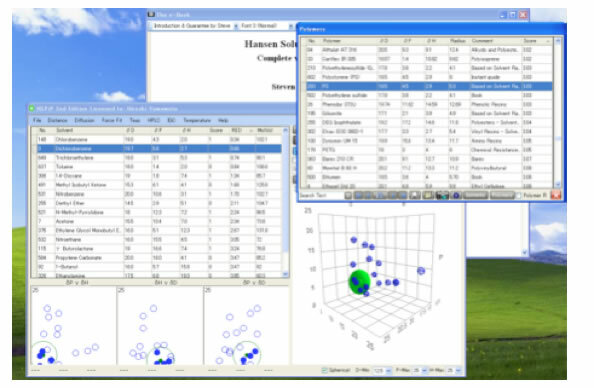 16 Chromatography – HSP creator and user HSP and chromatography – including a working HPLC retention time modeller and an IGC modeller. 17 Noses artificial and natural How HSP offer insights into odour detection. 18 Attacking DNA Insights into cytotoxicity. 19 Going nano Applying HSP to carbon nanotubes, C60, nano-clays and Quantum Dots. 20 DIY HSP Ways to calculate HSP for your molecules, including implementations of all common methods plus the new Stefanis-Panayiotou method and the automatic Y-MB method. 10 HSP is still being developed by Abbott, Yamamoto, and Hansen. HSP is the only unified, broad-range theory which is still developing intensely. We released 1st edition last December, in March we released the 2nd edition, and in June we updated the 2nd edition. Now we are preparing the 3rd edition. We improved the program, and data. We add extra functionality. We continue to give customers what they want for solving real-world problems. 2013.Jan. 2nd we launched Ver. 4.0.3.